Beautiful capture, Sharon. I love the composition, lighting, and the blue background it makes the flower really pop! Definately a favorite and vote. Well done!! 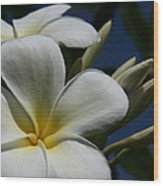 This brings back memories of Tahiti and Hawaii where the fragrance of plumeria filled my senses. Thanks for this so very beautiful photo, Sharon! Beautifully captured! I still remember the incredible fragrance of these flowers. Very beautiful image, Sharon. Love its artistic composition.
. thank you James . A beautiful image, Sharon, and the fragrance of the plumeria is absolutely exquisite!! Sharon this is exceptional :-) Not only is it a beautiful photograph, I can smell the gorgeous perfume of these flowers, something I really miss here! Bravo! Great lighting. it shows the soft texture of these beautiful flowers. 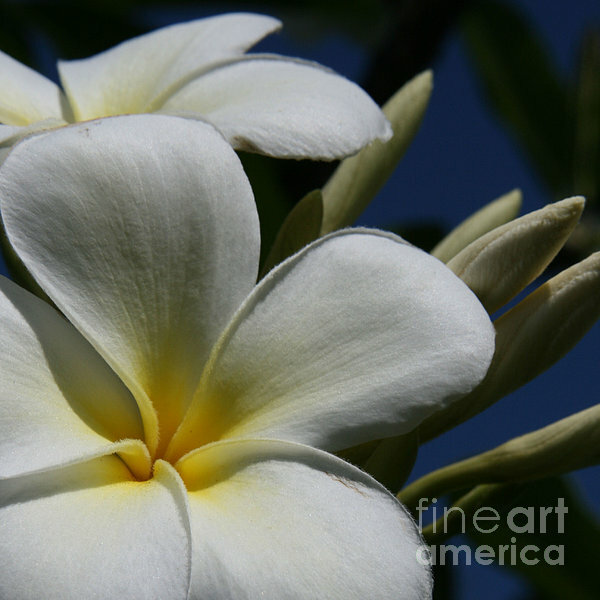 A fragrant and very beautiful white and yellow tropical Plumeria blooms in early morning light.